3. Meanwhile, in a sauce pot over medium heat saute onion in the olive oil. Add the garlic and continue to saute for another minute. Add oregano, basil and spaghetti sauce (reserve a little to put in the bottom of the pan) and the spinach; simmer 10 minutes. 4. In a large bowl mix ricotta cheese, mozzarella cheese, Parmesan cheese, parsley, salt, pepper and egg. 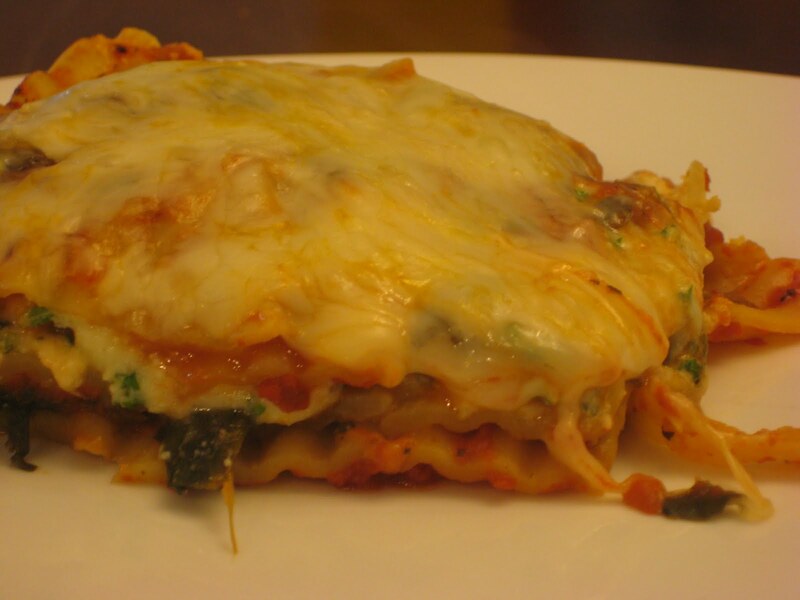 Reserve some of the mozzarella to top of the lasagna. 5. Place a small amount of reserved spaghetti sauce in the bottom of a 9 x 13 pan. Place 4 cooked noodles on top of sauce and top with layer of spinach mixture. Add 4 more noodles and layer with half of the cheese mixture, put more of the spinach mixture on top of that. Add 4 more noodles and repeat with the cheese mixture and spinach mixture. Add 4 more noodles, add the spinach mixture and top with mozzarella. 5. Cover with foil and bake in a preheated oven for 30 minutes. Remove foil and bake another 5-10 minutes.